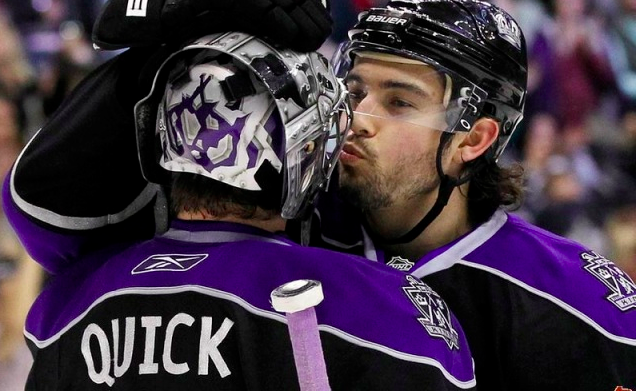 The Kings were eliminated last night in Game 6 of the first round of the Stanley Cup playoffs, so this is the post in which I officially kiss the 2010-2011 season goodbye. We had such high hopes for you, boys. October 2010 doesn't seem that long ago. This season really flew by. Bring on 2011-2012. God knows it can't be any crazier or more frustrating than what we just went through, especially since the guys are going to be another year older, another year wiser (right???) and more experienced. It will also hopefully see the arrival and emergence of Brayden Schenn (and a few other promising prospects) as full-fledged NHLers. Also, we seriously need scoring and a decent power play. A couple of goals here and there (on the PP and at full strength) and the Kings season plays out very differently. This was an issue all year and needs to be addressed. We absolutely cannot go through another season wishing league rules allowed us to decline power plays. Congratulations to the San Jose Sharks for moving on to the second round. Here's hoping your fans actually stay for the rest of your games, win or lose.